Posted April 17th, 2013 by Barry Berndes & filed under East County, La Mesa, Shopping, Specialty Malls. Posted October 27th, 2010 by Barry Berndes & filed under Banquets & Catering, Banquets and Catering, Casino Buffet, cuisine, East County, East County Restaurants, El Cajon, Featured San Diego Restaurants, Restaurants. Posted December 12th, 2009 by Barry Berndes & filed under Attractions, Banquets & Catering, Banquets and Catering, Buffet, Casino Buffet, Casinos, East County, East County Casinos, East County Weddings, El Cajon, Getaways, Home Page Content, Wedding Venues. Moments away from downtown San Diego, Sycuan Casino and Resort is the premiere daycation destination for San Diegans. Set amidst 425-plus lush acres, surrounded by picturesque mountain terrain, there are wonderful areas to walk around and take in the sites. This 305,000-sq. ft. casino is open 24 hours a day with 2,000 Vegas-style slot machines, a smoke-free poker room and a 51-table gaming room. Posted September 10th, 2009 by Barry Berndes & filed under Attractions, Casinos, Casinos With a Day Spa, Casinos with a Golf Course, Casinos With a Hotel, Casinos With a Resort, Casinos With Live Entertainment, East County, East County Casinos, East County Restaurants, Large Casinos. Posted August 10th, 2009 by Barry Berndes & filed under Attractions, Casinos, East County, East County Casinos, Small Casinos. Posted May 20th, 2009 by Barry Berndes & filed under Banquet Venues, Banquets & Catering, Banquets and Catering, Breakfast & Brunch, East County, East County Breakfast, East County Restaurants, El Cajon, La Mesa, Mexican, Party Venues, Restaurants, Restaurants, Santee. 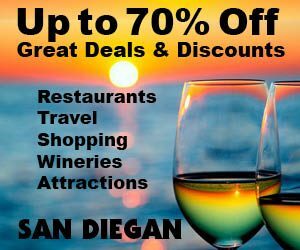 Posted April 30th, 2009 by Barry Berndes & filed under Banquets & Catering, Banquets and Catering, Corporate Meeting Venue, East County, East County Restaurants, East County Weddings, Italian, Party Venues, Pizza, Rehearsal Dinners, Restaurants, Restaurants, San Diego Coupon, Wedding Venues. Posted April 11th, 2009 by Barry Berndes & filed under Banquets & Catering, East County, East County Restaurants, Happy Hour, La Mesa, Mexican, Rehearsal Dinners, Restaurants, Restaurants. Posted January 9th, 2009 by Barry Berndes & filed under Attractions, Buffet, Casino Buffet, Casinos, Casinos With a Day Spa, Casinos With Live Entertainment, East County, East County Casinos, Large Casinos, Music. This 372,000-sq. ft. casino is open 24 hours with 2,000 slot machines, more than 85 table games and bingo. They have restaurants, live entertainment Wed.–Sun. and an outlet shopping center. You must be 18 years or older to enter the casino. Posted December 11th, 2008 by Barry Berndes & filed under Airports, East County. Posted December 11th, 2008 by Barry Berndes & filed under Airports, Borrego Springs, East County. Posted December 10th, 2008 by Barry Berndes & filed under Airports, Borrego Springs, East County. Posted August 7th, 2008 by Barry Berndes & filed under Banquets & Catering, Corporate Meeting Venue, East County, East County Banquets & Catering, East County Corporate Meeting Venues, East County Party Venues, East County Rehearsal Dinners, East County Restaurants, East County Weddings, Embarcadero Restaurants, Embarcadero Weddings, La Mesa, Lake View, Party Venues, Rehearsal Dinners, Restaurants, Seafood, Seafood. 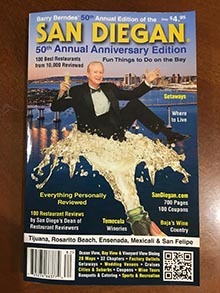 Posted June 14th, 2008 by Barry Berndes & filed under 44th Edition OR, Banquets & Catering, East County, East County Restaurants, Julian, Restaurants. Posted April 11th, 2008 by Barry Berndes & filed under Attractions, East County, Historic Museums, Museums. Posted April 11th, 2008 by Barry Berndes & filed under Attractions, East County, Historic Museums, Historic Sites, Museums. Posted April 11th, 2008 by Barry Berndes & filed under Attractions, Attractions in Old Town, Balboa Park, Borrego Springs, East County, Gaslamp Quarter, Historic Museums, Historic Sites, Julian, Museums, Old Town Museums, Suburbs. Posted March 21st, 2008 by Barry Berndes & filed under Banquets & Catering, Bay View, Corporate Meeting Venue, Downtown, Downtown Restaurants, Downtown Weddings, East County, East County Restaurants, Embarcadero, La Mesa, Lake View, Military Wedding Venues, Party Venues, Rehearsal Dinners, Restaurants, Restaurants, Seafood. Posted March 14th, 2008 by Barry Berndes & filed under Banquet Venues, Banquets & Catering, Banquets and Catering, Catering, Cocktail Parties, Corporate Meeting Venue, East County, East County Restaurants, El Cajon, happy hour, Happy Hour, Live Music, Mexican, Mexican Gourmet, Nightlife, Party Venues, Rehearsal Dinners, Restaurants, Uncategorized, Wakes & Funeral. Posted February 24th, 2008 by Barry Berndes & filed under Airports, East County, Ramona. Posted March 18th, 2007 by Barry Berndes & filed under Attractions, East County, Escondido, Fishing, North County, Poway, Sport Fishing, Sports & Recreation.